Ford will be the headline sponsor for this year’s Road Safety Week. Taking place between November 19-25th, the week-long national campaign is the largest road safety campaign of its kind in the UK. The campaign is organised by road safety charity Brake with the support of the Department for Transport. Brake’s director of campaigns Joshua Harris believes that Road Safety Week “provides a unique opportunity to focus the public and policymakers’ attention on saving lives on our roads”. 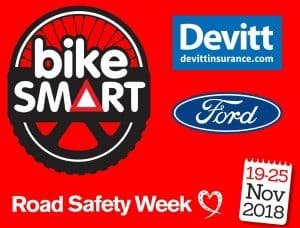 The theme of this year’s Road Safety Week is ‘Bike Smart’, focusing on the safety of vulnerable two-wheeled road users. More than a third of people killed or seriously injured on UK roads are cyclists or motorcycle riders. Consequently, Ford and Brake want to raise the awareness of the dangers this group of road users face and encourage safe behaviours amongst all road users. Andy Barratt, chairman and managing director at Ford of Britain, says more work can be done to make the country’s roads a safer place, especially for statistically vulnerable road users such as cyclists. “We are proud to sponsor Brake’s Road Safety Week, which shares common synergies with our Share The Road campaign. Together, we can make roads safer for all users,” he commented. Ford launched its Share The Road campaign in April, introducing a virtual reality demonstration that allows users to virtually experience a journey from the perspective of cyclists. The blue oval has been trying to improve road safety this month by taking its young driver training programme around the UK – read more about that here. Mr Harris added: “We’re pleased to welcome Ford as headline sponsors for this large national campaign – the biggest of its kind.